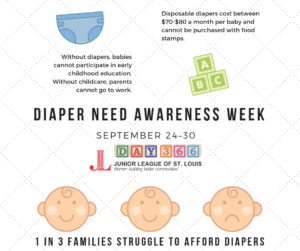 Junior League of St. Louis joins with other organizations in our community to bring awareness to the need for diapers for all. September 24-30, 2018 is Diaper Need Awareness Week. Diaper Need Awareness Week is an initiative created by the National Diaper Bank Network to bring national attention and mobilize efforts to end diaper need, a hidden consequence of poverty. Diaper need is defined as the lack of a sufficient supply of diapers to keep a baby clean, dry, and healthy.